What are ‘common frameworks’ and why are they needed? Where did the idea of common frameworks come from? What has been agreed on creating new common frameworks? Where will common frameworks be needed? Will common frameworks represent a ‘recentralisation’ of power to Westminster? Will common frameworks require legislation? What new governance arrangements will be needed to make common frameworks work? Image: Where will common frameworks be needed? Paun, A., Rutter, J., & Nicholl, A. (2016). 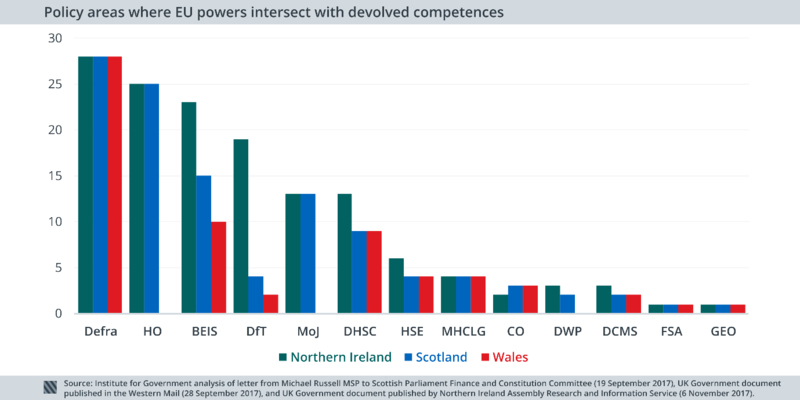 Devolution as a policy laboratory. (n.p. ): (n.p.). Paun, A., & Miller, G. (2016). [No description]. (n.p. ): (n.p.). Shipton, M. (2017, September 28). Who will be responsible for what after Brexit?.